If one is a glass-half-empty type of sports fan, there are indeed a few things not to like at the moment as spring attempts to take a hold on North America, from tone of the best NCAA basketball tournaments — Division 1 men’s and women’s — coming to an end to near-winter like conditions still plaguing many parts of the map and questioning whether we will ever get out of the grip of this deep freeze. (As we speak, we are now hearing about another “bomb cyclone” that’s going to drop in upwards of one foot of snow, spanning from Colorado to Minnesota.) But one thing that spring brings us that always is something to look forward to is the vagaries and excitement that only the Stanley Cup Playoffs can generate. Starting on Wednesday, and over the next two months, the race for Lord Stanley’s Cup intensifies as the National Hockey League’s second season commences. Great players become legends, super teams become immortalized and, conversely, the championship dreams of 15 teams come crashing down in heartbreaking fashion, but not before some serious drama takes place on the ice. Some storylines to follow during the next 60 days or so include whether St. Louis Blues goaltender Jordan Binnington can be the next great rookie phenom to take over the Stanley Cup Playoffs, will the return of playoff hockey in Long Island and the hallowed Nassau Coliseum spark the current edition of the New York Islanders to channel the great teams of yesteryear and if the Calgary Flames can parlay being the West’s best team in the regular season into a trip to the Stanley Cup Final for only the second time since their championship run 30 years ago. This season was not as dominant for the Nashville Predators as last season’s Presidents’ Trophy-winning squad, but it is possible that they might be all the better for it going into this year’s Stanley Cup Playoffs. Despite the lack of a scoring alpha, Forsberg has been a proven commodity in the playoffs for the Predators as he has led the team in scoring in each of the past two seasons during the Stanley Cup Playoffs, including during Nashville’s run to the Stanley Cup Final in 2017. What Nashville lacks in star power, they make up for in balance and scoring contributions from their defenseman, as the team has been one of the league’s best in getting production from their blue line over the past few years. This season was no different, getting 197 points combined (43 goals, 154 assists) from their blue liners, led by Roman Josi’s 56 points — 15 goals and 41 assists. Somehow, Nashville’s weakness, given their balance up front, scoring from the back and a solid situation in goal (Pekka Rinne & Juuse Saros had stellar seasons in goal once more) is when it’s on the man advantage, as the Predators finished dead last in the league in power play percentage at 12.9 percent. During the trade deadline, the Predators tried to address that glaring hole by acquiring forward Wayne Simmonds, who has scored at least 10 power play goals in a season six times in his career, from the Philadelphia Flyers at the trade deadline along with another big body to throw in front, Brian Boyle, from the New Jersey Devils. Unfortunately, in 17 games with the Predators, Simmonds scored just once, and that was at even strength. 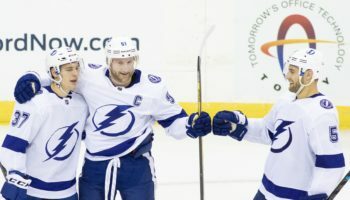 Carrying a wretched power play may prove to be fatal in this series, given that the Dallas has the best defense in the Western Conference and, even with the Islanders finishing just ahead of the Stars in goals against this season, arguably the best defense in the National Hockey League. The parsimony in Big D starts in goal, as both No. 1 goalkeeper Ben Bishop, who led the NHL in save percentage (.934) and was second in goals against average (1.98), and backup netminder Anton Khudobin were rocks in between the pipes, routinely bailing out the Stars out in games where they had been outplayed and severely outshot. Given Bishop’s history of being injury prone, including missing 16 games this season because of injury, don’t be surprised if Khudobin has to come in and shoulder the load somewhere down the line. If so, any drop-off in play would be minimal, if there is any slippage at all. Furthermore, Dallas has a couple of young stud defenseman in John Klingberg and Esa Lindell, players capable of joining the rush and creating havoc offensively while staying disciplined with their defensive assignments. 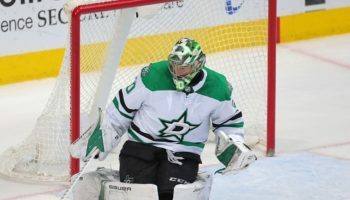 Conversely, the Stars should be thanking their lucky stars that they have the goaltender situation they possess because of their struggles all season long in putting the puck in the opponents’ net, finishing fourth from bottom in the league in goals per game (2.55). 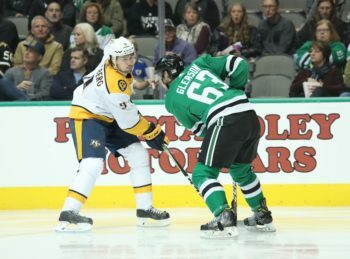 Their struggles scoring was highlighted by comments made by Stars CEO Jim Lites right before the New Year critical of star players Jamie Benn and Tyler Seguin for not being able to produce more scoring. 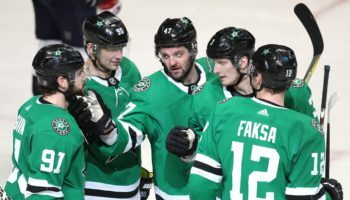 Those words were meant to spur on the team, though the Stars’ offense only slightly improved afterward. 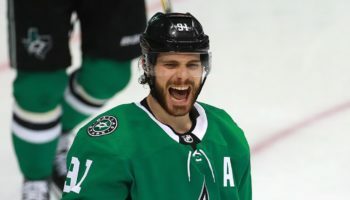 To their credit, Dallas did go 5-1-1 in its last seven games of the season to hold on to a Wild Card sport, something they were not able to do last season when it faltered miserably down the stretch. Benn and Seguin are the key men offensively, but Deadline Day acquisition Mats Zuccarello may be the X-factor. In his first game as a Star after coming over from the Rangers, he scored a goal and had an assist in a win at Chicago, but, coincidentally, he had to leave the game after breaking his arm. Zuccarello was able to come back to play on Apr. 2 against the Flyers, the only other game he played in a Dallas uniform. Reports are he is ready to go for Game 1. Though it is a tough ask for a rookie goaltender to shine in the playoffs, there have been a number of instances where neophytes have not let the white hot spotlight get to them in the Stanley Cup Playoffs, and netminders like Ken Dryden (1971), Patrick Roy (1986) and Matt Murray (2016) became Cup heroes in year one as a pro. There is a chance we could add another name to that list this postseason because of the stellar play of rookie goalkeeper Jordan Binnington in the Gateway to the West. The Blues were in last place in the National Hockey League when Binnington was called up from the minors in January after Jake Allen fell on his face and Chad Johnson did not fare much better. 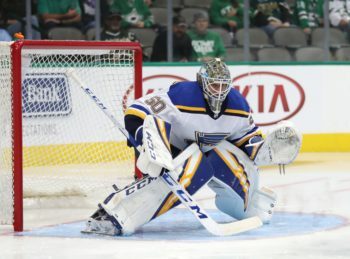 The rookie made his debut on Jan. 7, eight years after being selected by the Blues in the third round of the 2011 NHL Draft, and his 3-0 shutout victory over the Philadelphia Flyers proved to be a harbinger for both him and the Blues, as he went 24-5-1 with a league-leading 1.89 goals against average in 32 games (30 starts). His play almost singlehandedly carried the Blues to a division title, finishing just one point behind the Nashville Predators in the Central Division. Blues head coach Craig Berube ushered in a no-nonsense, near confrontational style of coaching his charges when taking over on Nov. 20 for Mike Yeo, and his demanding style yielded the desired results as the Blues have become a tough team to break down defensively, allowing a league-low 72 goals since the start of February. Despite their defensive rigidity, the Blues do have finishers on the other end of the ice, and Vladimir Tarasenko found his scoring touch at the right time, netting 16 of his 33 goals on the year since Feb. 2. While the Blues have trended upward, the same cannot be said about the Jets, who were flying high and leading the Central Division with 68 points at the beginning of February. Since then, they have gone 14-14-3 and needed to win in Arizona (a win which they did get, 4-2) in the regular season finale just to make sure to keep home-ice advantage to start the postseason. Even with their struggles, the likes of Laine, Scheifele, Wheeler and strike fear in so many defenses that the Jets, seventh in the NHL in goals per game (3.29), are always a threat to explode in any game, especially at the raucous Bell MTS Place in downtown Winnipeg. Along with those stars mentioned up front, Kyle Connor built on a strong sophomore season last season by scoring 34 goals this campaign, just four shy of Mark Scheifele’s team-leading 38 tallies. Connor Helleybuyck had a career year last season when he ended the regular season with 44 wins and as a Vezina Trophy finalist, so it was not too surprising that his numbers dipped a little this campaign. He did not have matched the otherworldly numbers that Binnington put up this season, but his run to the Western Conference final last season should allow him to have as much confidence going in between the pipes this postseason as his opposite number in goal. ALOST’s Prediction: It is no surprise that two teams with the same exact points total look to be evenly matched on paper. From then on, seeing which team has the home ice advantage might tell you how the series will tilt, and we believe that the cacophony in Winnipeg, especially in a deciding game, will win out. Slightly altering the lyrics of one of our favorite musical artists, Prince, the Calgary Flames are hoping to party like it’s 1989. That is the year that the Flames won their only Stanley Cup and, even with an appearance in Game 7 of the Stanley Cup Final back in 2004, this year’s edition appears to be the best team they have had in southern Alberta since the turn of the century, as they led the Western Conference with 107 points. Everything starts for the red-hot Flames with their blue-line stalwart, as captain Mark Giordano might have etched his name on the Norris Trophy this season with a historic campaign, becoming just the fourth defenseman aged 35 or older to have a 60-point season. Giordano actually ended up with 74 points on the season (17 goals, 57 assists), finishing behind only Brent Burns (83) of the San Jose Sharks for the scoring lead amongst defenseman. But there is depth in the front and with scoring in general for Calgary, as they are the only team in the NHL to have at least five players score 70 points this season: Johnny Gaudreau (99), Sean Monahan (82), Elias Lindholm (78), Matthew Tkachuk (77) and Giordano. Calgary scores goals, and they also limit opportunities of their opponents, allowing an NHL-low 28.1 shots per game. Unlike Calgary’s balance, Colorado is a top-heavy team, relying on their dynamic top line of Nathan MacKinnon, Gabriel Landeskog and Mikko Rantanen to shoulder the scoring load. MacKinnon, after finishing last season as a Hart Trophy finalist, was actually better this season as he put up a career-high 99 points (41 goals, 58 assists). Rantanen almost followed him step-for-step, posting 31 goals and 56 assists before missing the last eight games with an upper body injury. Rantanen is questionable to start the series and, if he not ready, Alexander Kerfoot needs to continue to elevate his play on the wing in place of Rantanen on the top line. Calgary has a number of defensemen who can score, but Colorado also has an offensive-minded defenseman that gets lost in the shuffle in the talks of the best defensemen in the National Hockey League. 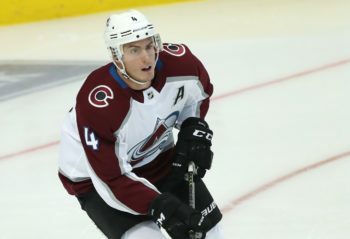 Tyson Barrie finished with a career-high-tying 14 goals while quarterbacking a power play that finished seventh in the NHL at 22 percent. Former Washington Capital goaltender Philipp Grubauer, who started the first two games of Washington’s Stanley Cup championship run last spring before giving way to Braden Holtby, had a terrific second half of the season to wrest the No. 1 job away from Semyon Varlamov. Though going only 9-9-2 since Feb. 23, Grubauer has posted a spectacular .956 save percentage during that stretch. It did not help that Rantanen missed those games late, as Colorado had to eke out low-scoring games and rely on Grubauer to hold the fort while the offense tried its best to generate scoring while its top line was compromised. ALOST’s Prediction: The Calgary Flames will score goals in this series. They will also allow their fair share, given their shaky goaltender situation. Colorado’s dynamism with its top line (assuming full health) makes this series one where an upset is ripe for the picking. We were close to pulling the trigger, but, in the end, we chickened out in going bold here. They cannot possibly do it again! Can they? It is hard not to be intrigued at what the Vegas Golden Knights, winners of the Western Conference and the runner-up to the Washington Capitals in the Stanley Cup Final in their first year of existence last season, will do for an encore this time around. While it was not as much of a magic carpet ride like last season, the Golden Knights still grinded out wins in the Western Conference and passage into the Stanley Cup Playoffs was relatively safe. 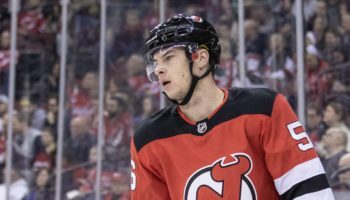 Though many of the players on last year’s team will be part of this year’s possible run, the Golden Knights did not sit back at the end of last season’s run to the Cup Final, acquiring players like Max Pacioretty, Paul Statsny and, at the trade deadline, former Ottawa Senator Mark Stone to give an already deep team some more valuable depth. Before acquiring Stone, the Golden Knights were averaging 3.00 goals per game, but that number shot up to 3.32 once he was acquired on Feb. 25. Overall, the Golden Knights finished just a hair behind the Carolina Hurricanes in leading the league in shots on goal per game (34.3) while finishing fifth from the top in fewest shots per game allowed (29.3). However, the team will go as far as Marc-Andre Fluery goes, and if he can replicate last year’s playoff heroics, there’s no reason Vegas can’t once again be the darlings of the postseason. The 34-year-old and future Hall-of-Famer once again had a pretty stellar regular season in posting a .913 save percentage, though there is concern about his health as he just came back to action right before the season ended to play in the last two games after missing nine in a row due to an undisclosed injury. Knowing the Sharks playoff disappointments over the years, plus the fact that star players like Joe Pavelski, Joe Thornton and Brent Burns, among others, are heading towards the twilight of their careers, this feels like one of the last real gilt-edged opportunities for San Jose to get back to the Cup Final and bring the Stanley Cup to the Bay Area for the first time. 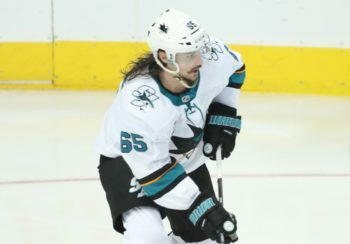 To the credit of the Sharks’ front office, they made sure to make splashes to keep infusing and imbuing the team with young talent to mix in with their veteran touch, and their acquisitions of two-time Norris Trophy winner Erik Karlsson and former Red Wing Gustav Nyquist did eventually provide the boost necessary to lift San Jose into a top-two spot in the Pacific. ALOST’s Prediction: Vegas can no longer be marketed as Cinderella after last year’s run, but they are a proven commodity in the postseason, which could benefit them as well. Then again, the Golden Knights won’t have the chip on their shoulder that they did during last season when most of the players were motivated by being released by their teams and made available in the expansion draft before heading to Sin City. However, San Jose has as much talent and depth as the Golden Knights, and just need Martin Jones to come close to equaling Fleury’s best to win the series. We say Jones will not up to the task, and the over-the-top, Hollywood-like theatrics before games at T-Mobile Arena will be on display for at least two playoff rounds.